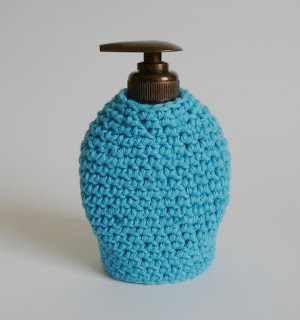 I can hardly believe that we're already on day FOUR of my Soap-tacular SOAP DISPENSER WEEK!!! Mimsey is participating in our library's summer reading program. Jake and I have been putting her in it since the first year she was eligible. I like it, because it makes us prioritize library trips, and we read waaay more books to Mims (says her mom, hanging her head in shame). The last time we were at the library, Jake wanted to get some books on shed construction, so we all walked over to the adult section of the library. Mims and I wandered into the crafty section where I made a shocking discovery. There were 3 books on crochet in my local library. 3! Now, perhaps the library had just had a massive run on crochet books and these were the only 3 left, but I doubt it. There were 3 large stacks (the bookcase kind) of craft books, and at least 4 shelves devoted to knitting books. Yet, there were only 3 crochet books?! What's up with that?! So, I grabbed a DIY wedding book, since there were bound to be some fun and different ideas in there, and a book on jewelry making, and we went on our merry way. Much later, when I finally got around to looking through my borrowed books, I found that while there wasn't anything in them that directly appealed to me, I did find myself inspired to create something wholly new based on some of the ideas in the books. 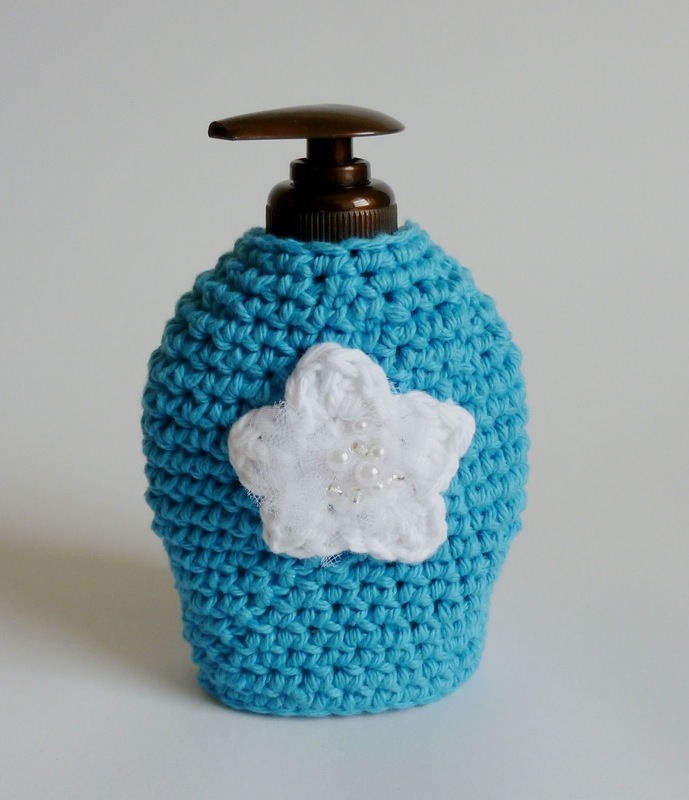 Particularly, I found myself drawn to the idea of handcrafted wedding favors. There's just something so precious and intimate about creating something that you know your guests will treasure as much as you treasure their participation in your special day. For days I've been dreaming about what I might create for my guests if I was planning a wedding (which I am not). What I came up with was an idea for an ornament. Certainly it could be hung on a tree at Christmastime, but I think it would be pretty hung in the home as well. I was going to make one to hang from the glass knob of the medicine cabinet in my bathroom, and then I realized that I could use it to decorate the front of one of my hand soap covers! Two birds, one stone! To add the fancy-schmancy star on the front, I crocheted a mini version of my star pattern out of white worsted weight cotton yarn. I sewed two layers of tulle and some plastic pearls and glass beads in the center. Then I used white cotton yarn and stitched it on the front of the cover. If you turn it wrong side out, I think it will go through the wash with no problems, but I wouldn't recommend putting it in the dryer. You can use any weight yarn, with an appropriately sized hook. 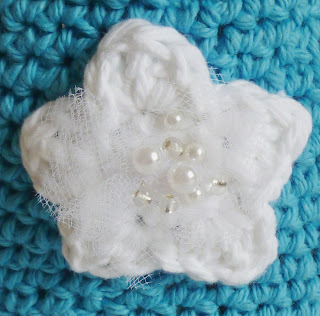 It also looks really cute in size 3 crochet thread... I made my star out of worsted weight yarn and a size G hook. Sorry about the all white text background today on this post. I can't for the life of me figure out how to make it go back to normal... LOL!!!! Do you have these in PDF?? Thanks Mom! I love you too! Love the look and wanted to thank you for all of your hard work on the patterns! Hi Piper and Chaotic! You guys rock! Thank you for your sweet comments! You're welcome, I meant it.